This video’s been a bit of a sleeper hit around my house. 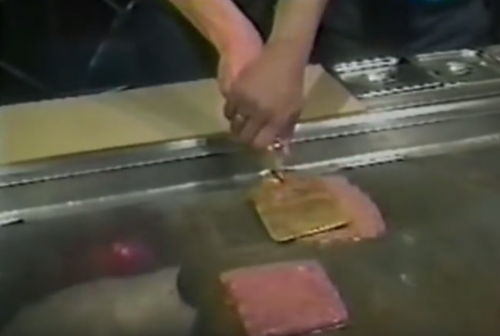 On the surface it seems sort of unremarkable given the other fast-food training videos of the era like “Grill Skills” and “Clean It”, but something about it has infected us. Maybe it’s Julie’s enthusiasm. 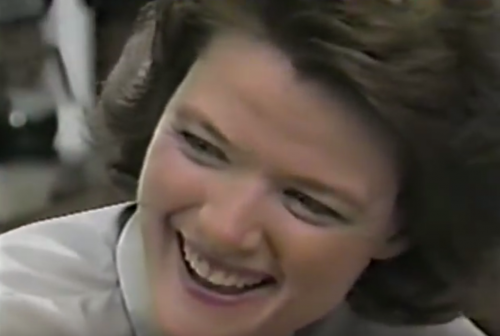 Maybe it’s her brown-plaid-on-brown-on-brown uniform. 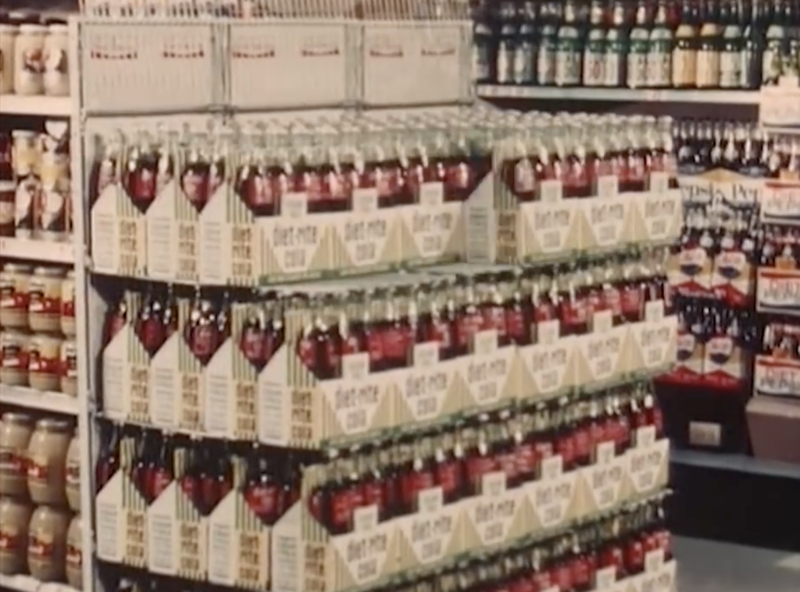 Maybe it’s the painful visual reminders of the days when Pizza Hut was a dine-in parlor with tavern lighting, pitchers of soda, and tabletop arcade games. Maybe it’s the frequent attempts to force their then-slogan “Making it Great” into casual conversation. Maybe it’s the shout-out to Priazzo, their surprisingly complicated take on the Italian pie. And maybe it’s learning about the existence of Fairy Dust, the magical Pizza Hut blend of spices that…cough…”makes it great.” Whatever it is, my five-year-old (and the rest of us) can’t get enough of seeing Julie learn the ins and outs of how to make a pan pizza, a thin crust, a Priazzo, and a personal pan pizza. And here’s a bonus! 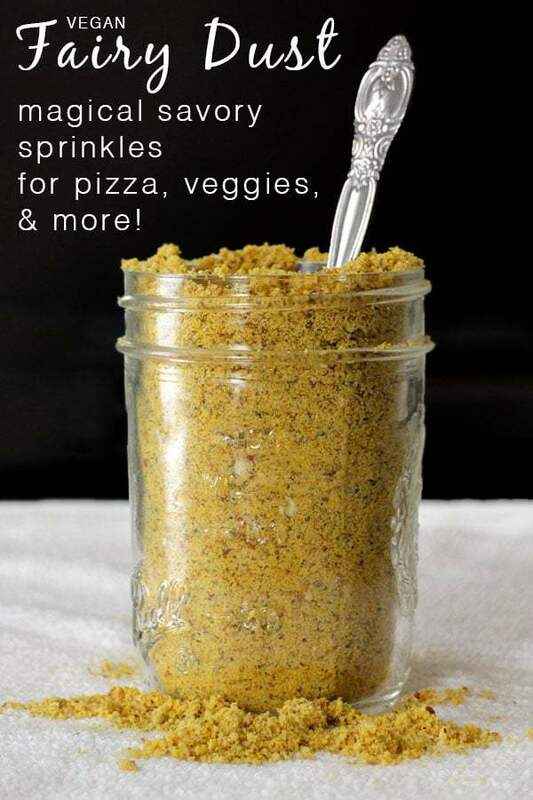 It’s my wife Becky’s take on Fairy Dust over at Glue & Glitter. It’s legit! 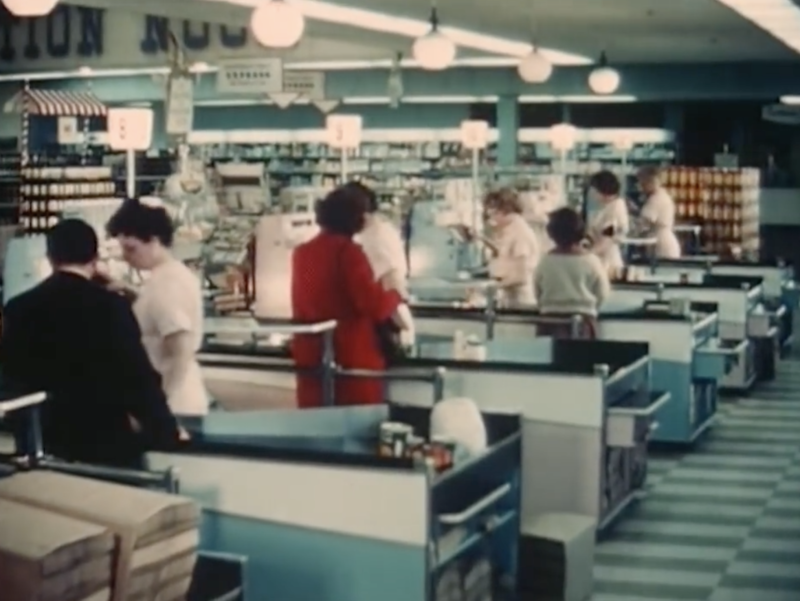 This 1960s training film on the merits of good checkout procedure places an awful lot of responsibility for the store’s performance on what happens in the checkout lane. 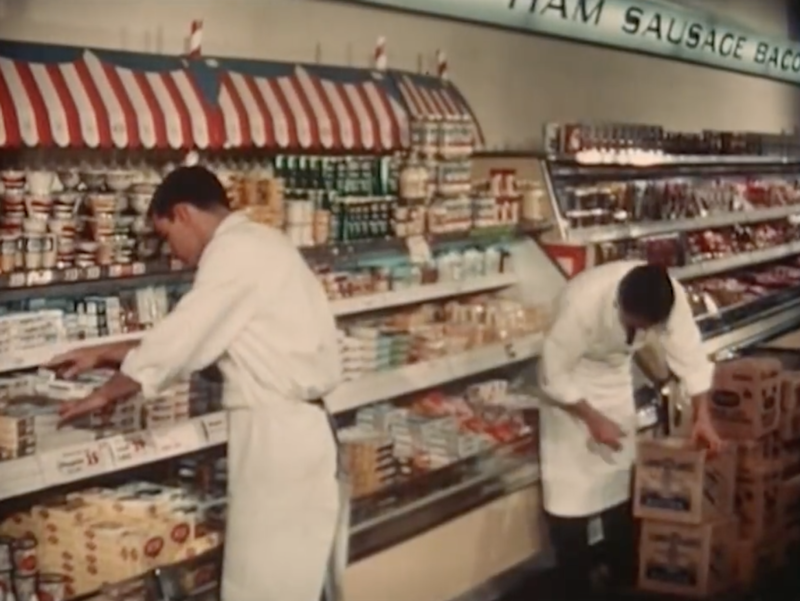 Indeed, they are “The Front Line” in the grocery war. Seriously, they just casually call it a war. 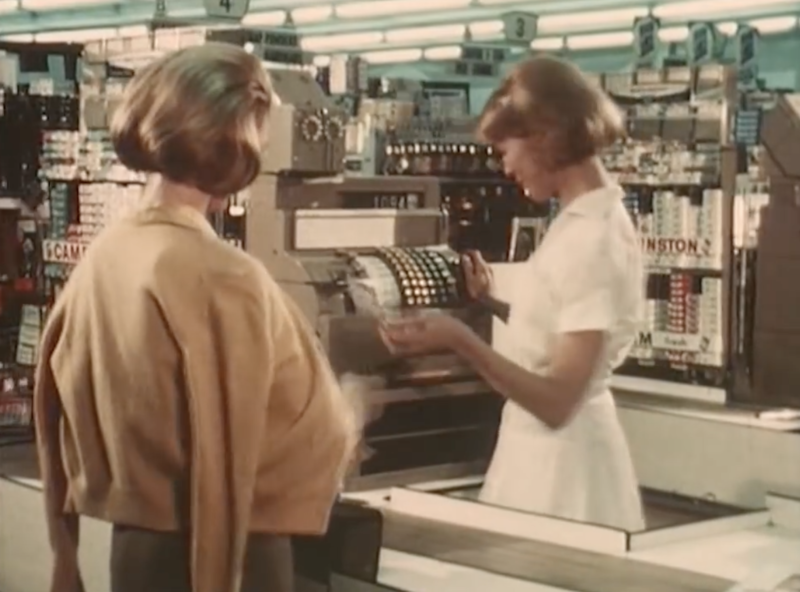 I’m not going to spend time romanticizing the actual advice given in this film; it boils down to ‘make the right amount of change’, ‘don’t get tricked by crooks’, and ‘sell stuff at the right price.” The way they give the advice, though, is great: the hair and fashion are top-notch for the era, and the large green “test room” has an awesome visual aesthetic. 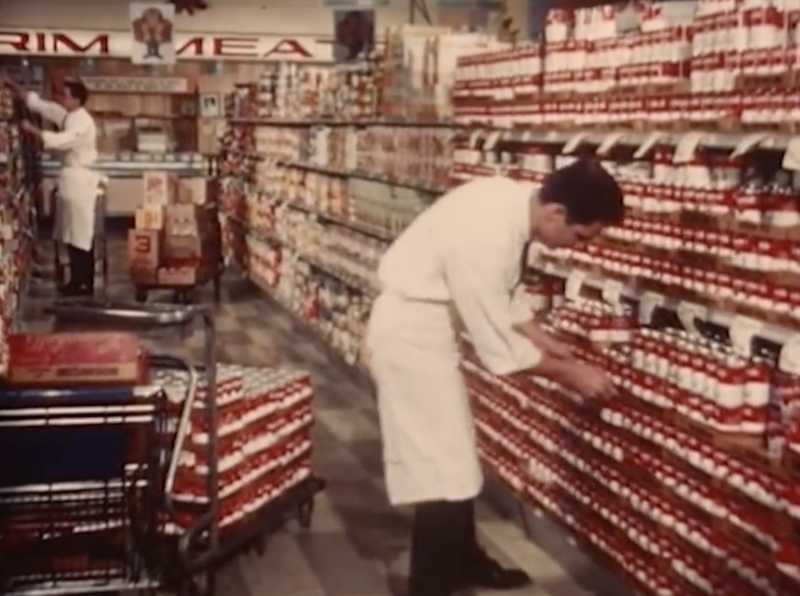 The real star of the film, though, is the reality of the 1960s grocery store and the golden crossroad of an almost clinically clean store design filled with beautifully packaged processed foods. It’s worth “checking out”. Get it? Sorry. Here it is. 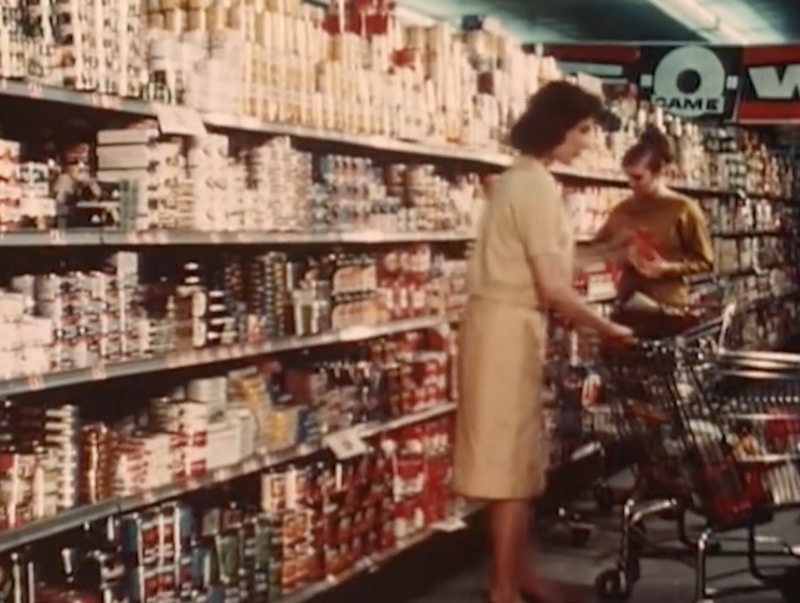 Speaking of war, this 1970s spot for Cadbury’s mashed potatoes is nothing less than a declaration of it from those smug Martians. 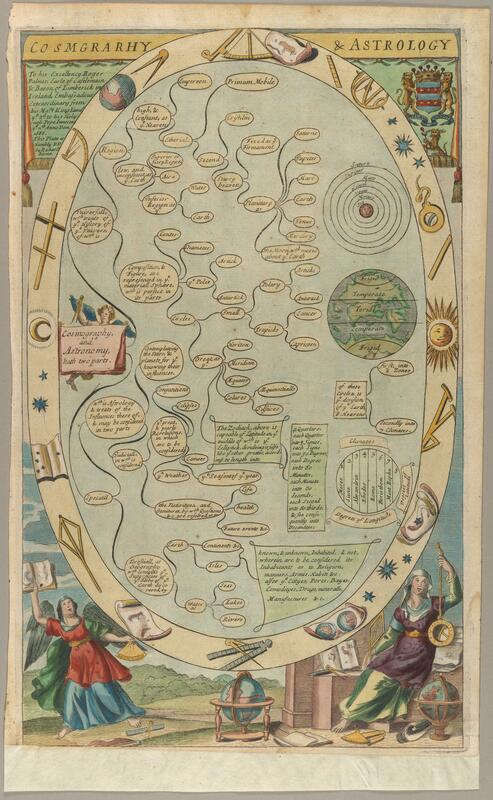 This beautifully confounding print from 1686 demonstrates the various applications of Cosmography and Astrology. I don’t know who these people thought they were fooling. This is a cereal made of styrofoam that nobody would enjoy. Heineken’s got the right hook, here. 1. 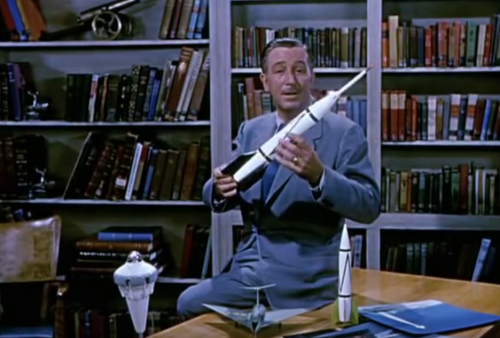 Man in Space – Futurist Disney is, without a doubt, my favorite kind of Disney. 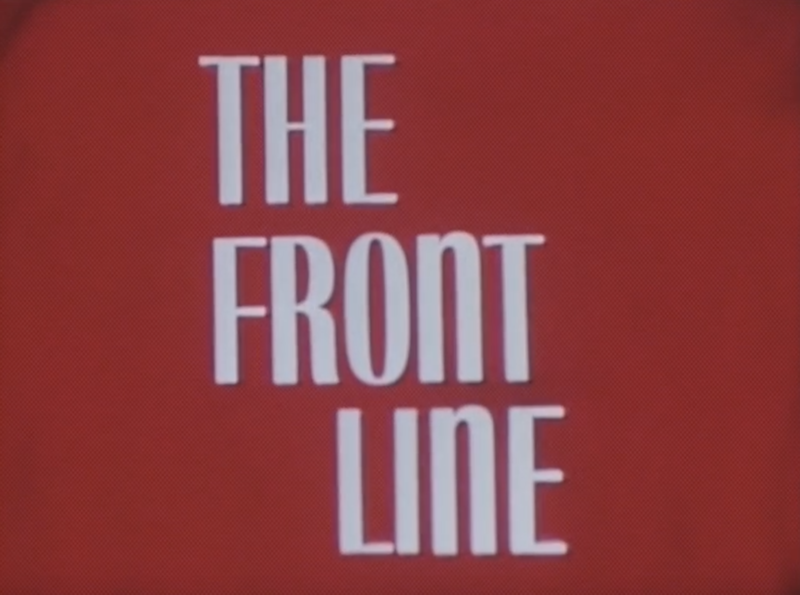 Here’s a documentary from the early side of the futurist Disney era, featured on the Wonderful World of Disney. 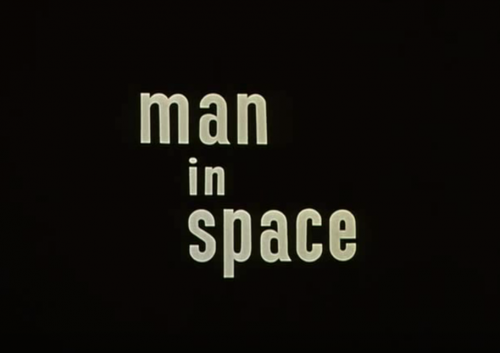 Man in Space is a pretty earnest effort to educate (presumably) children about the mechanics involved in getting a man into space and keeping him alive there for an extended period of time. It combines live action clips and scenes animated just for this film, and both aspects are remarkable. Walt sets us up for what we’re about to see, explaining that in just the next few years the impossible will become possible. 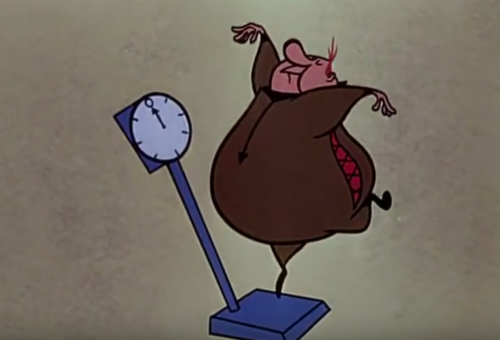 He then turns it over to Ward Kimball, one of the Nine Old Men, to take us through it. Ward also holds a rocket. 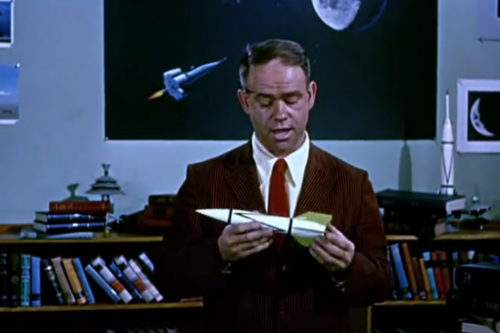 The first segment of Man in Space gives us the history of rocket technology, complete with beautiful-yet-occasionally-offensive-these-days animation. 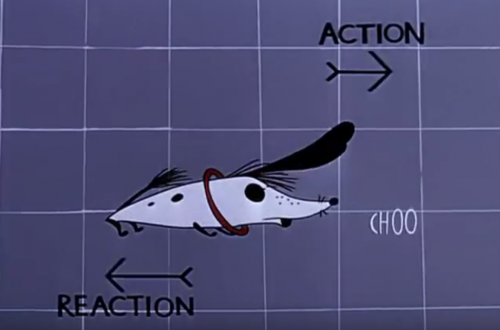 Newton makes an appearance, too, and the idea of action and reaction is introduced which will play significantly through the film. 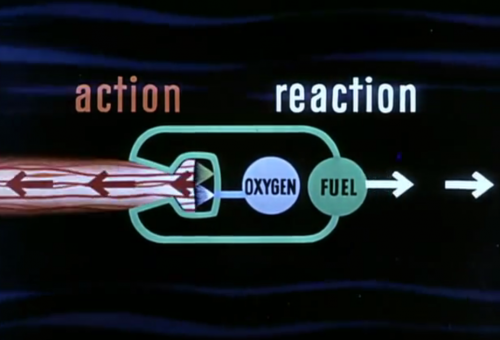 The next section focuses on then-current efforts to get a rocket into space and keep it there. Willy Ley takes over, giving a rundown of what they expect to achieve over the next few years with rocket-stage technology. Heinz Haber takes the reins for the third segment of the film, discussing the complexities of keeping a man alive and mentally stable in “the incomprehensible nothingness of space”. 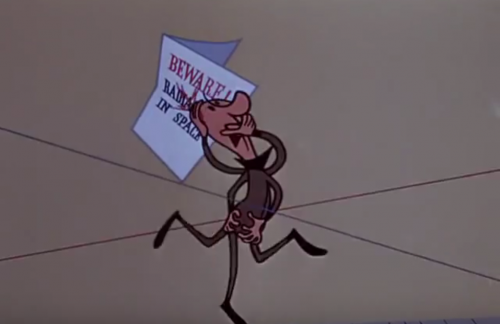 There are some pretty great animations in this segment featuring the average Joe in space, dealing with things like weightlessness, cosmic rays, and meteorites. 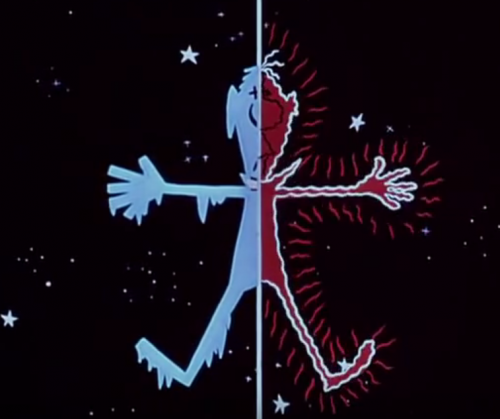 Spoiler: the meteorite kills him and then his body boils on one side and freezes on the other. Seriously. This happens in the film. 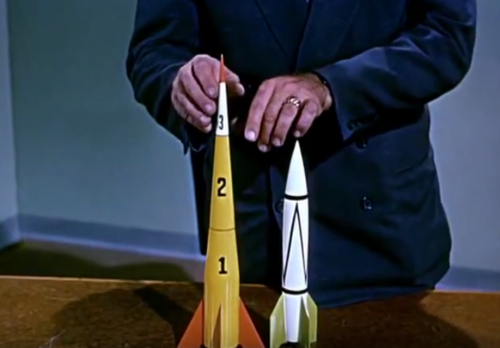 Werner Von Braun brings it home in the final segment to discuss the future of the American space program, detailing a ‘what-if’ scenario for the next few years that hits surprisingly close to the mark. 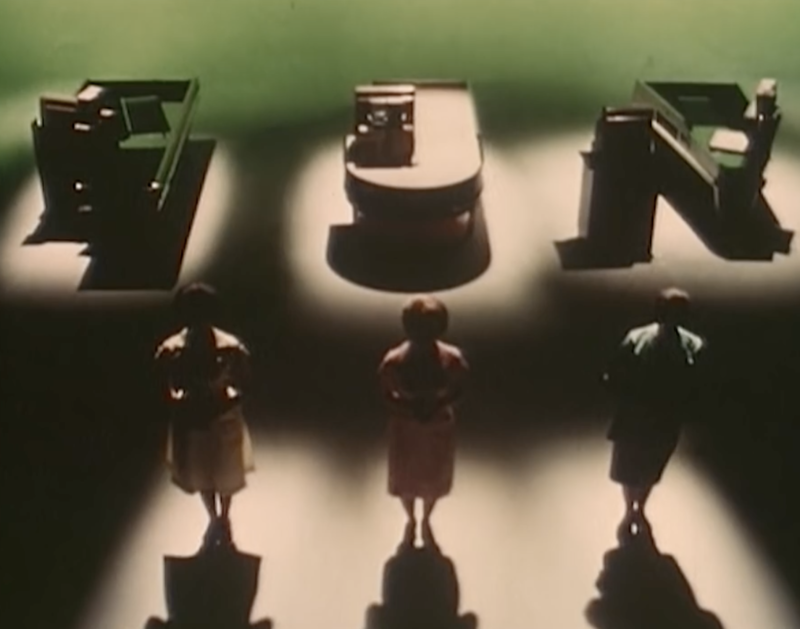 That’s the thing about this film – for something produced and released in 1955 there’s a lot of dreaming and stuff that never materialized, but also a lot of practical thinking and stuff that did. I think you can say that about a lot of Disney’s futurist thinking, and whenever I read about guys like Elon Musk and their enthusiasm and ideas for the future I get a whiff of the same scent. It’s encouraging, and I wish there were more of it. 2. 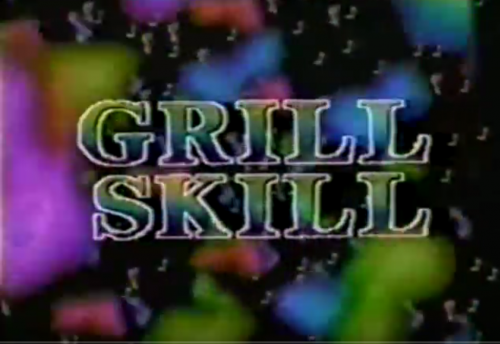 Grill Skill – We’ve recently learned that Chili Can Be Served With Cheese, but here’s a training video from Wendy’s in 1989 that goes into just how that huge grill should be managed. As expected, it’s song-based. 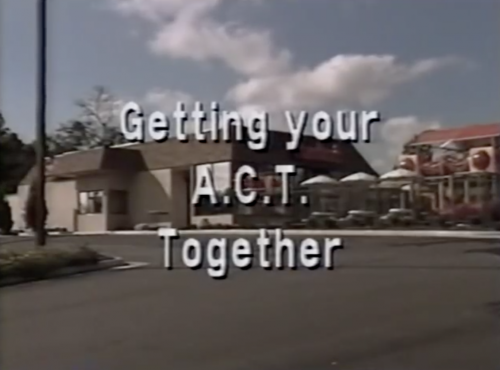 The video follows Bill, a young up-and-comer at Wendy’s, who’s getting promoted to grill duty that day. His manager sits him in front of a television mounted in what I assume to be a corner of the restaurant and gives him a VHS to place into the television. 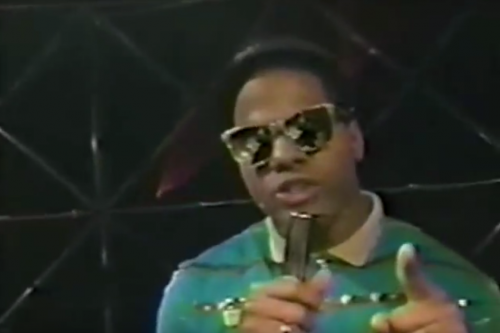 He does so and the TV goes haywire….revealing a rapper! 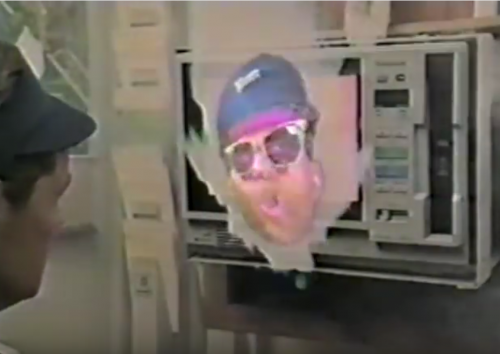 Bill gets sucked into the TV and ends up in some sort of strange nether region with the rapper and a grill and a supply of fresh ground beef and NOTHING ELSE. The rapper takes Bill through a five minute song that goes into great detail on how to properly cook a Wendy’s burger. 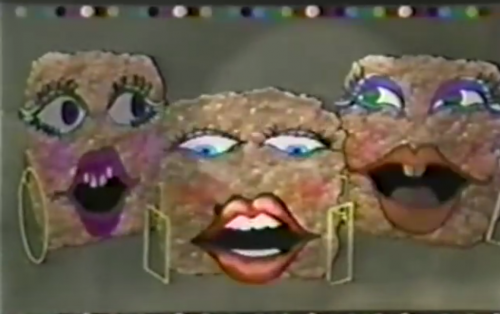 There’s a neat segment where the ground beef itself has cartoon faces and sings about its various cycles of life on the grill. Did I say neat? I meant horrifying. Once the rap is done, Bill recites the rap back to the rapper without the benefit of the music. The rapper gently corrects him on a few missteps. 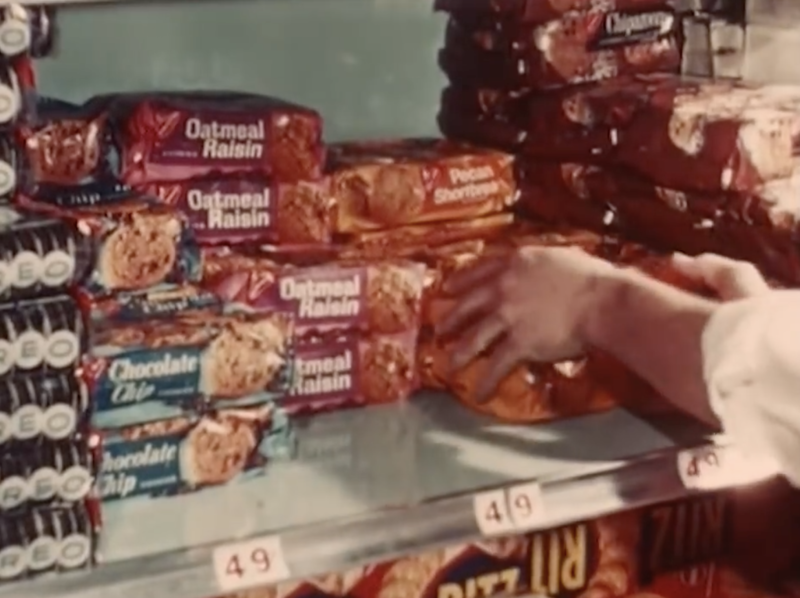 Then (and this was a reveal for me on the level of the ending of Soylent Green or Se7en), the rapper casually mentions that botched/over/undercooked burgers end up IN THE CHILI. Seriously?! Why does that gross me out so much? Upon proving his mastery of Grill Skills to the unnamed rapper, Bill is sent back out into the real world where he has to prove his mastery to his unnamed manager. There’s a weird sequence of them forming what appears to be a love connection over the grill. The video then becomes a music video of a bunch of Wendy’s employees singing about Grill Skills. There’s no real value or message or instruction to take away from this video; it seems to be there just to pad the length. Also, a guy plays air guitar on a spatula. Where “Chili Can Be Served With Cheese” exhausted viewers at 4 minutes, “Grill Skill” runs fifteen! Yet it must be viewed. Do so now. 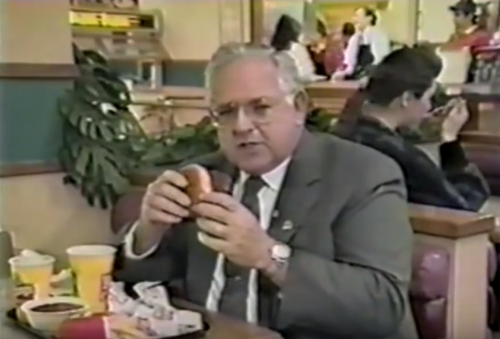 Don’t miss Dave Thomas there at the end, sitting down to a table with a bowl full of REJECTED MEAT CHILI. 3. 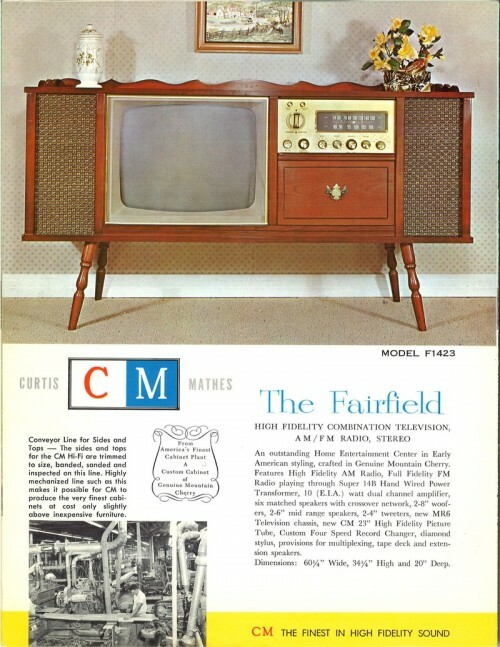 Fairfield – Gorgeous ad here from Curtis Mathes for the Fairfield, an elegant combination television, AM/FM Radio, and Stereo. That Curtis Mathes logo is no slouch, either! 4. Major Matt Mason – Speaking of Man in Space, here’s Mattel’s Major Matt Mason. That’s a pretty nifty spider crawler he’s sporting there on the moon. 5. 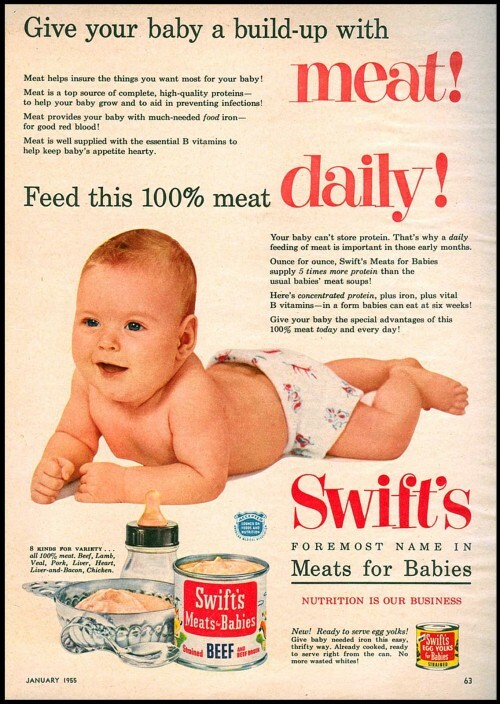 Meat for Babies – This one makes me shudder. It can’t be real, right? An appalling yet beautifully laid out ad. Don’t miss those “New! Ready to serve egg yolks!” either! 1. 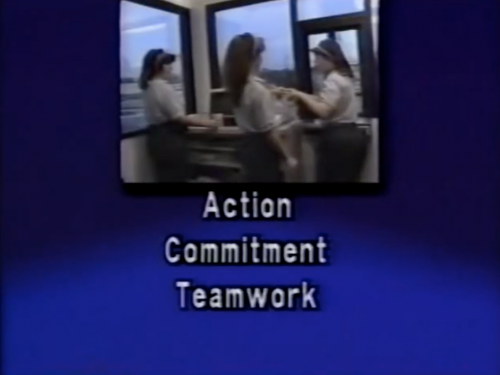 Betamax Salesman Training Video – You might look at something titled “Betamax Salesman Training Video” and think, snoozefest. You might be right! But not this time. 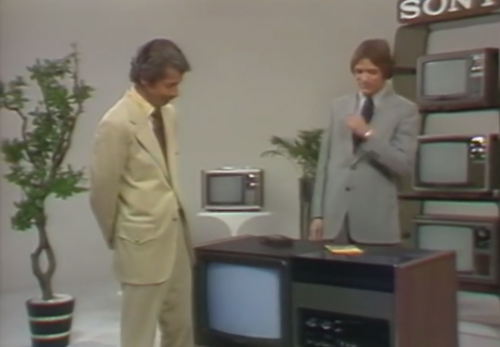 There’s a lot to love about this video – the fashion and set design of the era, the trumped-up abilities of the video tape recorder and, most of all, the smug salesman pitch that makes me happy I was never on a 1977 showroom floor. The video encourages salesmen to roleplay their sales pitch to each other, and the tension that appears between the two example salesmen when figuring out who’s going to be the pitch-man is a little awkward and…romantic? 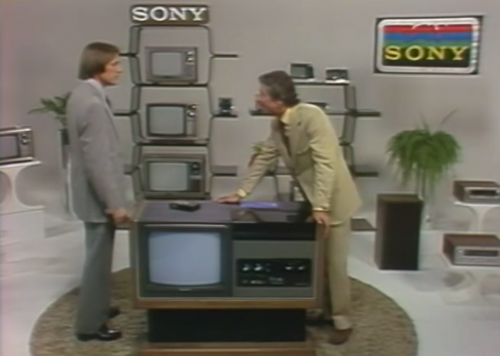 Here it is, every talking point of the beautiful Betamax console unit in 6 short minutes.